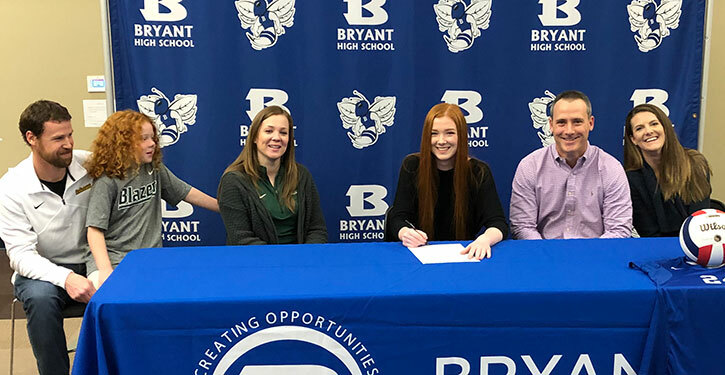 On the day she signed to continue her education and her volleyball career at Belhaven University in Jackson, Miss., Faith Stone got a surprise letter. Bryant head coach Leigh Ann Back read it to her without telling her who it came from. She figured it out after a while. “I wanted to surprise you on a day that back in my day, meant so much to me as well. “Let’s start with the fact that I’ve known you since you were such a clumsy little 14-year-old. I have watched you improve day after day, month after month. You have become the type of player that any coach could play. “You took my attention with your great volleyball skills and by the way the love the game. But that’s not why you kept it. Not only are you an amazing player that works very hard when the game gets tough, you’re the kind of player that will play your heart out every play of every game, the kind that will not let her teammates down but, instead, supports them and cheers them on even when you’re having difficulties of your own. Your team spirit is awesome. And, Faith, I hope you never change in years to come. I have to say that I’m very proud of you and the person you’re becoming. You’re such an awesome friend who I get to call my little sister. 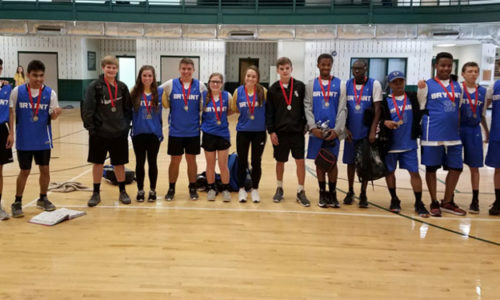 The letter came from Adisa Hodzic, a former volleyball player and graduate assistant coach at the University of Arkansas-Little Rock, who had taken Stone under her wing as a coach for her club team and a personal coach as well. Hodzic’s visa ran out so she had to move back to eastern Europe where she currently plays professional volleyball in Boznia. “She’s coached me since I was 14,” said Stone, the daughter of Phyllis and Jeff Dills and Daniel and Tara Stone. “It was actually a long process,” she said of her recruiting. “I had a to make a lot of recruiting profiles and I ended up getting a lot of offers but (Belhaven head coach Justin Dee) came to a lot of my tournaments and watched a lot of my games and stayed consistent. “I wasn’t really considering anywhere else because I already fell in love with the school,” she said. “It’s really nice. Everyone’s really welcoming there. It’s just really pretty there. Stone, a front row player, was voted the team MVP for the season, earned all-conference honors and is a nominee for the annual Arkansas High School Coaches Association All-Star game in June. Stone said she started playing volleyball when she was in the sixth grade, around 12 years old. “I used to play basketball,” she stated. “I guess I played that because it was our family sport. Then when I started playing volleyball, it just clicked, and I just loved everything about it. It was awesome. “It’s been really hard,” Stone allowed. “There’s been a lot of hard coaches and it’s hard to get used to some kinds of coaching because they’re all different. I’ve worked really hard, done a lot of private lessons. I haven’t gotten to hang out with my friends a lot because I’ve been playing volleyball. It’s what I’ve put first.